This article is about a sports announcer. 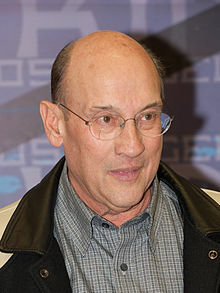 For other uses of the name, see Bob Miller (disambiguation). Robert James Miller (born October 12, 1938) is a retired American sportscaster, best known as the play-by-play announcer for the Los Angeles Kings team of the National Hockey League on Fox Sports West/Prime Ticket. Miller held that post with the team from 1973 until his retirement in 2017. He was partnered with Jim Fox from 1990 to 2017. Miller received his degree in communication studies from the University of Iowa. While there, he began his broadcasting career, covering the school's football and basketball games for campus station KRUI-FM. After his graduation in 1960, Miller began working in television sports journalism in Wisconsin. He later would add announcing duties for the football and hockey teams at the University of Wisconsin–Madison. Jiggs McDonald was the Kings' original play-by-play announcer, serving from their inception in 1967 to 1972, when he left to join the newly-established then-Atlanta Flames (now the Calgary Flames). It was in 1972 that Miller submitted a tape to then-Kings owner Jack Kent Cooke, who was also the owner of the Los Angeles Lakers basketball team. While Cooke said to him "You're going to be my choice", Cooke instead decided to hire long-time San Francisco Bay Area announcer Roy Storey to fill the void left by McDonald. When Storey left the team after one season, the Kings turned their attention back to Miller, who was then hired in 1973, and served as their play-by-play announcer until his retirement in 2017. Due to the NHL's exclusive national broadcast contract with NBC that prevented local television announcers to call playoff games beyond the first round, Miller and broadcast partner Jim Fox were not allowed to call the Kings' Stanley Cup Finals games on television. But due to their overwhelming popularity among fans, Kings management had Miller and Fox record their call of the potential clinching games for later distribution. Miller's broadcast partners have included Dan Avey, Rich Marotta, Pete Weber, the current radio voice of the Nashville Predators, current Kings radio voice Nick Nickson and Miller's current broadcast partner is former Los Angeles Kings right wing Jim Fox. Miller's first book, Tales From the Los Angeles Kings, was published in October 2006. Miller's second book, Tales From The Los Angeles Kings Locker Room: A Collection Of The Greatest Kings Stories Ever Told, was published in April 2013. On March 2, 2017, due to health reasons, Miller announced his retirement as the team's television play-by-play announcer, a position he held for 44 years, and at the time of the announcement, having called 3,351 Kings games,. His retirement became effective after the final two regular season games of the Kings' 2016-17 season, a home game against the Chicago Blackhawks on April 8, 2017, and a road game against the Anaheim Ducks on April 9, 2017. On September 12th, 2017, the Kings announced that Bob Miller would remain with the Kings organization as an ambassador and continue to contribute to the team on a part-time basis which includes being the MC for the Kings Legends Nights. He has performed voice over and on-camera work for television shows and movies in scenes which included a hockey announcer. Among his credits are an episode of Cheers and the films Rollerball, Miracle on Ice, The Mighty Ducks, and D2: The Mighty Ducks. Nationally, he has worked for ESPN, ABC and FOX. He also called some games for FX during the 1996 World Cup of Hockey. Miller was honored by the Hockey Hall of Fame as the 2000 recipient of the Foster Hewitt Memorial Award, and was inducted into the Los Angeles Kings Hall of Fame, into the Wisconsin Hockey Hall of Fame, and into the Southern California Sports Broadcasters Hall of Fame. The press box at Staples Center, the Kings' home arena, is named in his honor. Miller received the 2,319th star on the Hollywood Walk of Fame, in television, on October 2, 2006. At the ceremony he noted, "My greatest fear is that I retire and the Kings win a Stanley Cup the next year." Those fears would never come to be as on June 11, 2012, the Kings finally won the Stanley Cup. The team would win another one two years later in 2014. In 2014, Miller was honored by the Big Ten Club as their Person of the Year. In 2015, Miller received the Radio and Television News Association of Southern California's Lifetime Achievement Award at the 65th annual Golden Mike Awards. On January 13, 2018, Miller became the third person from the Los Angeles Kings to be honored with a statue outside of Staple Center, joining Luc Robitaille and Wayne Gretzky. Miller also became the first non-player to be honored with a banner hanging from Staple Center's rafters. Miller is married. He and his wife Judy have two children. ^ a b c d e f g h i j k l m n o p Los Angeles Kings 2011-12 Media Guide. Los Angeles Kings. p. 27. ^ Gase, Thomas (2007-07-19). "King of the booth". The Acorn. Retrieved 2010-02-25. ^ a b Stewart, Larry (1998-01-31). "From Cooke to the 'Mainstay' of the Kings (page 1)". Los Angeles Times. Retrieved 2010-02-25. ^ a b Elliott, Helene (2000-11-14). "Voice of the Kings Gets Royal Treatment at Last; Hockey: Bob Miller receives media honor in Hall of Fame after years of being overshadowed in L.A." Los Angeles Times. Retrieved 2012-09-29. ^ a b Stewart, Larry (2006-10-03). "Miller Is Star of This Show". Los Angeles Times. Retrieved 2010-02-25. ^ a b c Elliott, Helene (2012-06-05). "Bob Miller, Jim Fox to record Stanley Cup call". Los Angeles Times. Retrieved 2012-06-17. ^ Elliott, Helene (2000-11-14). "Voice of the Kings Gets Royal Treatment at Last". Los Angeles Times. Retrieved 2010-02-25. ^ Matsuda, Gann (September 9, 2009). "Bob Miller: The Los Angeles Kings' Greatest Ambassador". FrozenRoyalty.net/Gann Matsuda. Retrieved July 22, 2017. ^ Matsuda, Gann (May 8, 2013). "Hall of Fame Announcer Bob Miller Publishes New Book About LA Kings 2012 Stanley Cup Run". FrozenRoyalty.net/Gann Matsuda. Retrieved July 22, 2017. ^ Matsuda, Gann (March 3, 2017). "Bob Miller's Retirement Press Conference Was Really About All of Us Instead". Retrieved July 22, 2017. ^ Rosen, Jon (March 2, 2017). "Bob Miller To Retire; Will Broadcast Final Two Regular Season Games". Retrieved July 22, 2017. ^ "Foster Hewitt Memorial Award Winners". Hockey Hall Of Fame. Retrieved 2012-09-29. ^ Stewart, Larry (1998-01-31). "From Cooke to the 'Mainstay' of the Kings (page 2)". Los Angeles Times. Retrieved 2010-02-25. ^ Stewart, Larry (2002-02-05). "Scully Receives Two Awards". Los Angeles Times. Retrieved 2010-02-25. ^ Matsuda, Gann (September 6, 2012). "Stanley Cup Win Allays LA Kings' Hall of Fame Announcer Bob Miller's Greatest Fear". FrozenRoyalty.net/Gann Matsuda. Retrieved July 22, 2017. ^ "Lifetime Achievement Award: Past Honorees". Radio and Television News Association of Southern California. Retrieved July 22, 2017. ^ Zupke, Curtis. "Kings will honor former broadcaster Bob Miller with a statue outside Staples Center". latimes.com. Retrieved 2019-02-02. ^ "LA Kings Honor Bob Miller With Statue Unveiling, Banner Raising". 2018-01-13. Retrieved 2019-02-02. This page was last edited on 28 March 2019, at 02:48 (UTC).